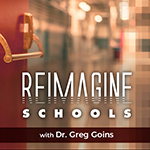 In this episode, Andrea Gribble, a social media specialist and founder of #SocialSchool4EDU, talks about her passion for helping schools celebrate their students in a safe and positive way with social media and offers tips on how you can “tell your school story” by creating a hashtag and branding your school district. Gribble also talks about social media’s big four platforms - Facebook, Twitter, Instagram and YouTube and offers suggestions on how to maximize your time and resources with a dedicated social media plan. Twitter: @andreagribble. Website: https://ift.tt/1DR1dw6.